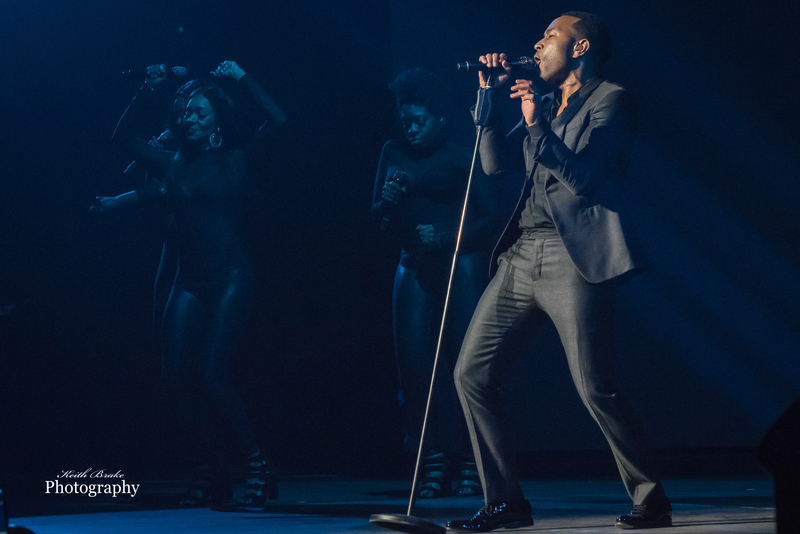 This past Thursday (6-15-17) St. Louis hosted one of the most prolific artists of our time, John Legend. The venue of choice for the event was The Fabulous Fox Theatre, one of the most beautiful rooms in all of St. Louis. The name, Legend, how would one live up to having that name? I suppose one would start by being nominated for 28 Grammys and winning 10 of them, an Academy Award, an AMA award and many, many more; in fact, 31 awards in total out of 45 nominations. If Mr. Legend were a professional baseball player his batting average would be .688, and that alone would certainly make one a legend. If you noticed the star rating to the upper left, you will see all are 5 light, on this night in the gateway city John’s performance left no room for anything but a 5 star review. Right from the moment the house lights dimmed the entire room was filled with joy, anticipation and excitement. John added a bit of suspense to the cocktail by performing almost the entirety of his first selection in a shroud of darkness tucked away from the view of the audience. When Mr. Legend stepped into the light he brought the crowd to its feet, and that is where they remained for a majority of the evening. John owns the stage, the audience and the moment completely with a deadly combination of striking good looks and more charisma than can be properly quantified. Mr. Legend engages the crowd, makes you feel welcome, shows his affection for you and blows your mind with a voice more clear and powerful than one can fathom. 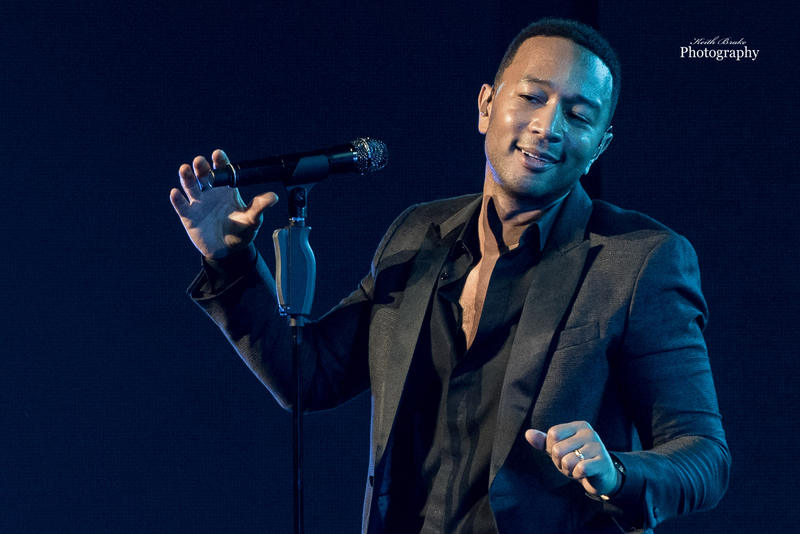 Hearing John Legend sing live is something every music lover should treat themselves too, it truly is pure magic. The evening was packed full of memorable moments, and spine tingling perfection. During his performance of “Slow Dance”, John brought a lucky young lady on stage to dance with. He danced with her, sang to her and then kissed her on the cheek sending her away as, I promise, the happiest person in the entire theatre. 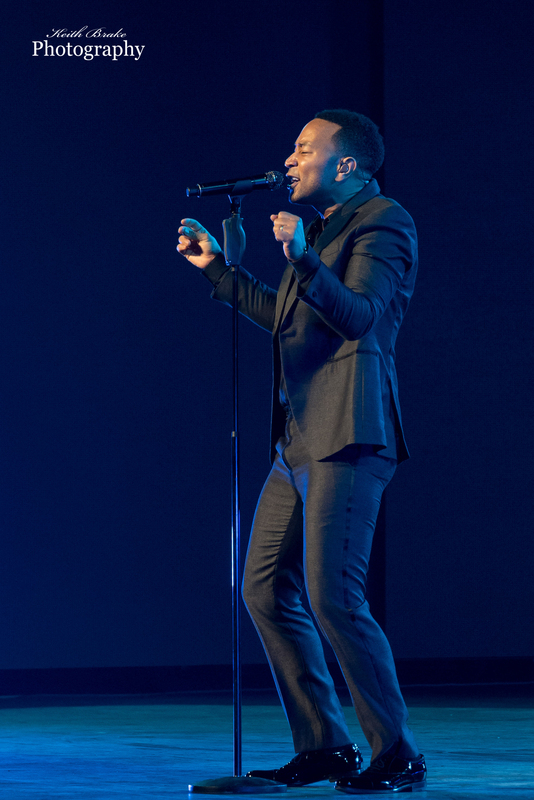 The crowd was treated to a magical performance of “Like I’m Gonna Lose You”, it was powerful and emotional just as it should have been, just like he and Meghan Trainor recorded for her album “Title”. The biggest stand out moment of the evening for me was a cover song. Anyone who is familiar with music knows you have to have a lot of guts to cover The Beach Boys, and even more guts to choose “God Only Knows” as the song to be covered. This song is so well known that nothing short of perfection will be tolerated, no problem for John. Directly following his song “Right By You”, a song he wrote and performs for his daughter Luna, the stage went dark. Two opposing spotlights illuminated John from both left and right and he then delivered what was the most astounding cover of the old Beach Boys tune I have ever heard, oh yea, he did it a Capella. With no music and no accompaniment John Legend and his powerful, beautiful, magical voice captivated the hearts and minds of the entire room; without a doubt one of the most awe inspiring moments I have been in attendance for. What a great review. Reading it felt like I had a first row seat last thursday at the concert. Thanks Joe! Glad you enjoyed it! You really captured some special moments. Can always count on an amazing review from you…props!